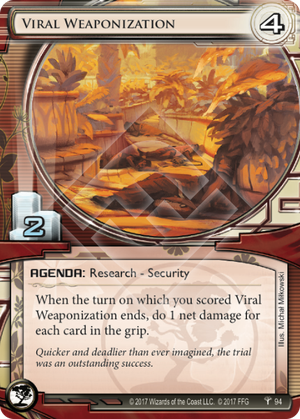 When the turn on which you scored Viral Weaponization ends, do 1 net damage for each card in the grip. Quicker and deadlier than ever imagined, the trial was an outstanding success. If the Corp has a rezzed Genetics Pavilion when they score a Viral Weaponization, does the Runer draw 2 or 3 cards if I've Had Worse is trashed? The Runner will draw the full 3 cards. Viral Weaponization triggers at step 3.4 of the Corp's discard phase, which is still part of the Corp's turn. Lets compare this to Nisei MK II. Viral Weaponization trashes the runner's grip, taxing them ~5 clicks. It also has the side benefit of disrupting their game plan. Nisei MK II, when used on a scoring server, would cost the runner a click and a massive amount of credits. It can also open a scoring window.